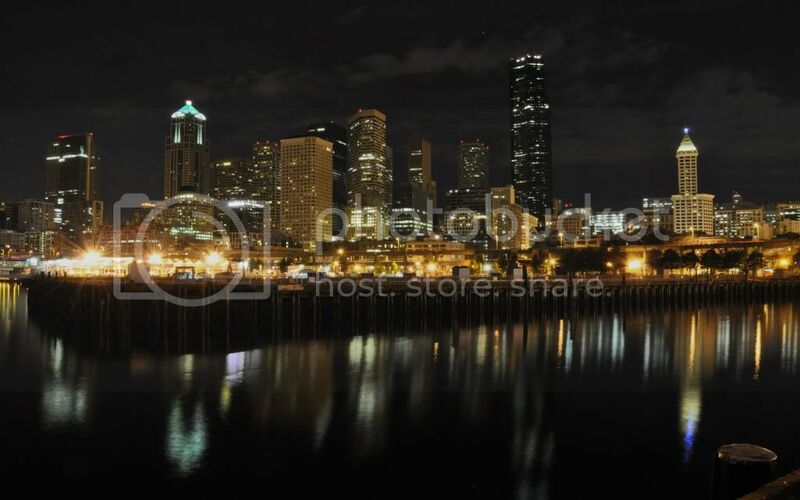 I work on tugboats in Puget Sound, mostly out of Seattle now and in my opinion, Seattle has by far the most visually appealing skyline from the water of any city on the west coast from both a daylight and night perspective. For anyone who was lucky enough to have been in Western Washington on the afternoon of 10/29/10 you know what amazingly beautiful day it was for the last week of October. 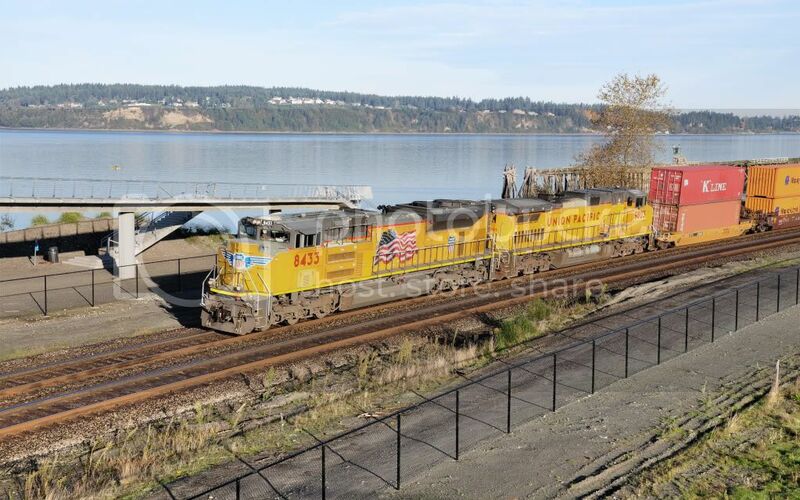 While waiting for an inbound container ship on that day, I caught this northbound loaded coal train surrounded by Fall colors near Pier 70 / Myrtle Edwards Park. Tail end of the same train. 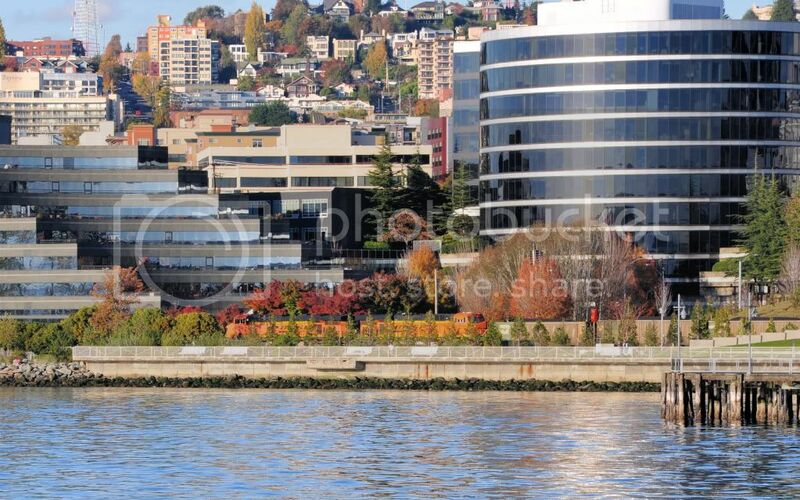 The building in the lower right is the Edgewater Inn. No trains, but just had to share. This was taken from a dock, the tug moves too much for night shots. Very nice. 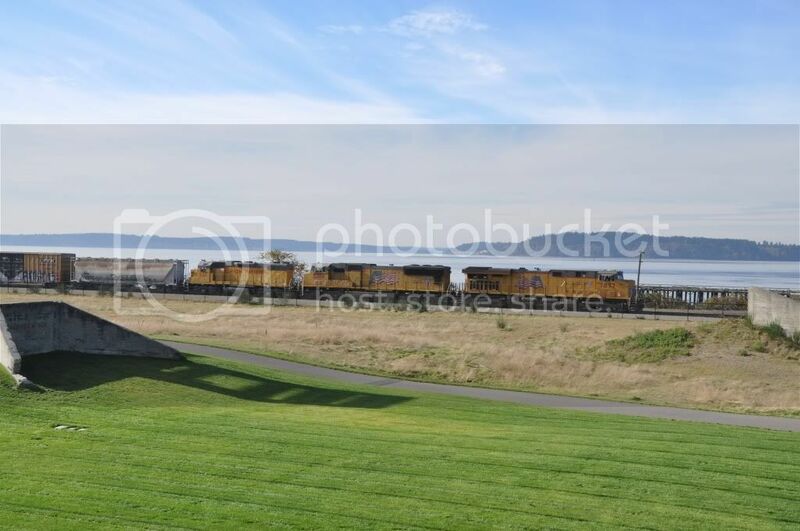 Certainly a different angle on that coal train. The night shot is spectacular. Great shots. Very few of us have an opportunity to take photos from the water. John, Bill, Thanks for the kind words. I have only had my Nikon D90 for a few months and have not had near the time I want to go out and play, but if I can play at work so much the better. Another great day today and I'm swamped with "honey do's", but I have permission to play hooky tomorrow, if I get any good shots I'll post a few. Great photos. Do you handle any ships for T46? If so, I probably have a shot of you! Yes, I think usually COSCO ships, Red Stack does Hyundia. Maybe its Pier 37, what ever the south end of that dock is, butts up to the Coast Guard Base. I'm home, I tend to forget all that stuff. OK, I found the info, we do P-37. Pier 37 and 46 used to be separate, when Hyundai had 37 and Hanjin had 46. 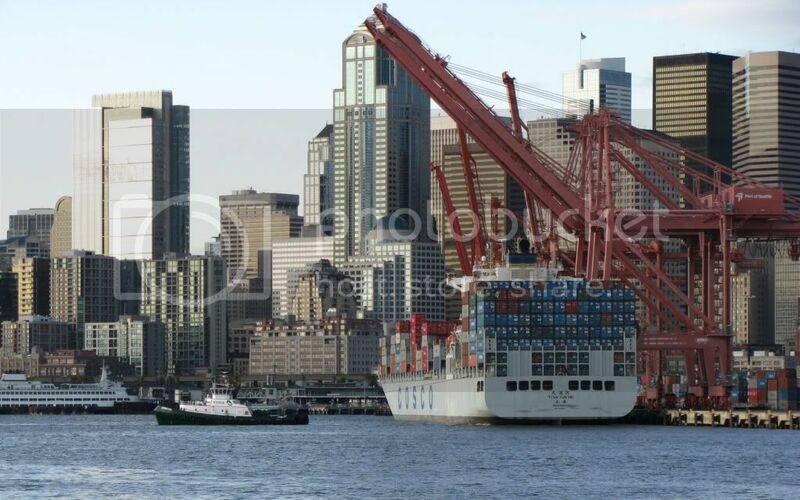 Now it is just one terminal for Hanjin but the Pilots and Tugs still refer to the old piers even now. I work for T46 managing the Hanjin container ships in Seattle. I have tons of photos of you guys working - primarily the Wedell, Henry, and Andrew. Actually if you check the latest TowBitts, my photo of CMA CGM vessel departing is on the last page. Nice to meet another maritime worker who's into trains as well. Steve Carter posted a thread about University Place in the Tacoma area and Chambers Creek properties and this is where I spent from 9:00AM to about 1:20PM taking pictures and walking my legs off. In that six hour span I was treated to 10 trains, 4 BNSF, 3 UP and 3 Amtrak . Regretfully in almost every photo is the is the hideous black fence, a necessary evil to protect pets and idiots. Not really sure why we have to protect the idiots, just my opinion. I believe this was the Everett-Pasco. I have an amazing ability to void my mind of everything "work" when I'm home and make it all come back when I go back to work. So if I sound like a space cadet, well, at times, but not at work, at least not in writing. Hanjin is what I was thinking of, not Hyundia. I have been on the Andrew since July when they sent my regular boat, the Benjamin too Calif.
That night shot was taken at the N. end of P-47. After they tore down the warehouse on P-48 it really opened things up. This is a picture of the Andrew assisting the TIAN YUM HE out of P-42 or 47 on May 18, 2010. I was still on the Benjamin when this was taken. Very nice, love the shot since you can't be anywhere but on the water for it. 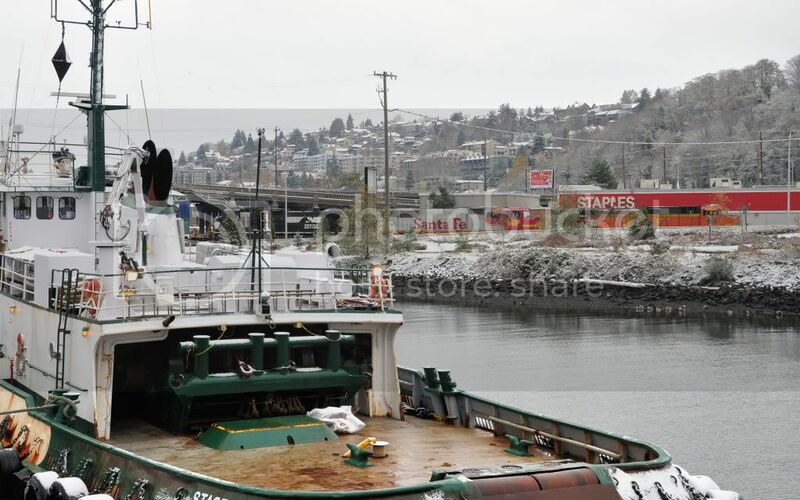 Do you work the Foss barge and Boeing oversize containers at all? I heard that they no longer rail them down the hill, instead they are planning on trucking them? I don't see how that's possible but who knows. 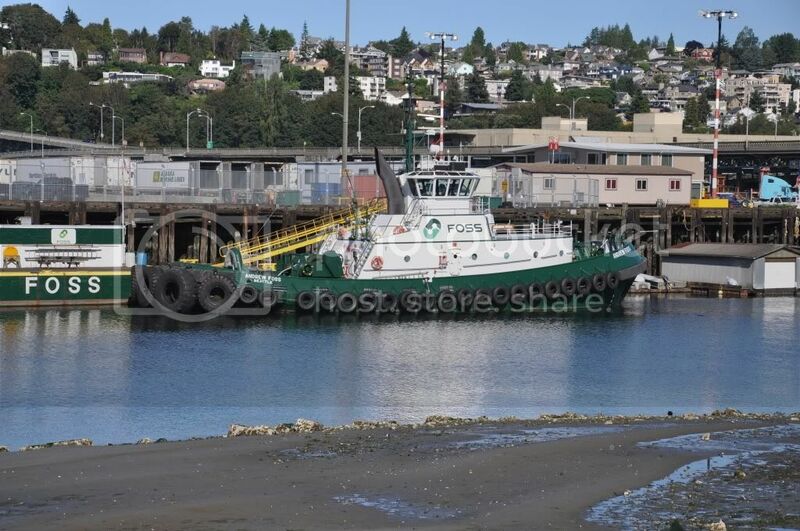 I've gone on a tug a few times, and even got to drive the Chief once when there was nothing around in Elliott Bay. You guys get some really nice views. I have not heard anything about trucking the containers. If I get a chance I'll ask the Everett longshoremen if they know anything. Nice pictures on your web site. It's amazing the amount of containers full of bobbles and trinkets that are traveling around the world. The word I get in regards to trucking containers is this: There are some smaller containers that can be put on chasses and some that have to be put on lowboys that can be trucked, other than that, all others are of a size that it would be impractical to ship any other way than rail. So, you might see some going by truck, but no one I talked with sees an end to the bigger cans going by rail. The double high containers go up and down the hill by rail. 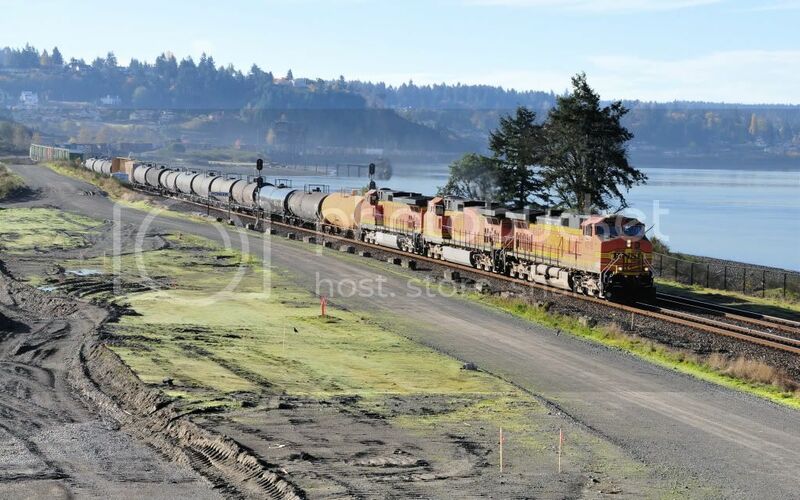 For the past month or so they have been loading/unloading the containers at Boeing in a different spot due to the rebuild of a railroad crossing where the new 767 tow path will cross over. High winds and waves hit the Sound yesterday (11/20). 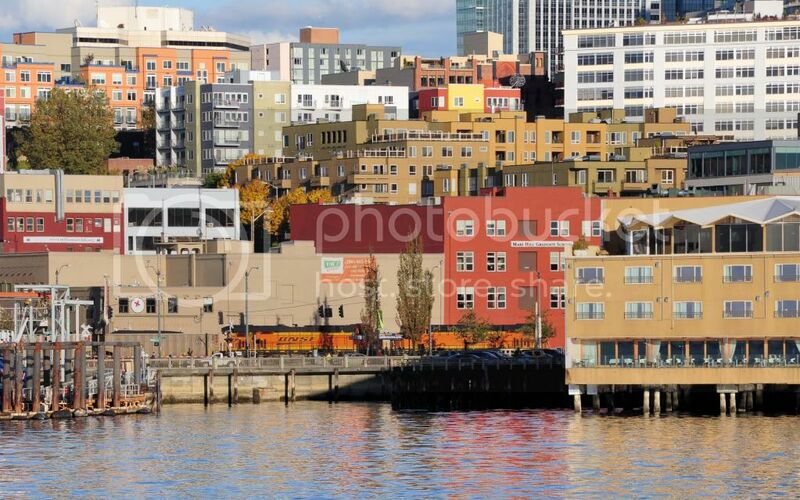 Any photos from Elliot Bay? Winters not over, I'm sure I'll get another chance. Winter has not even started yet. 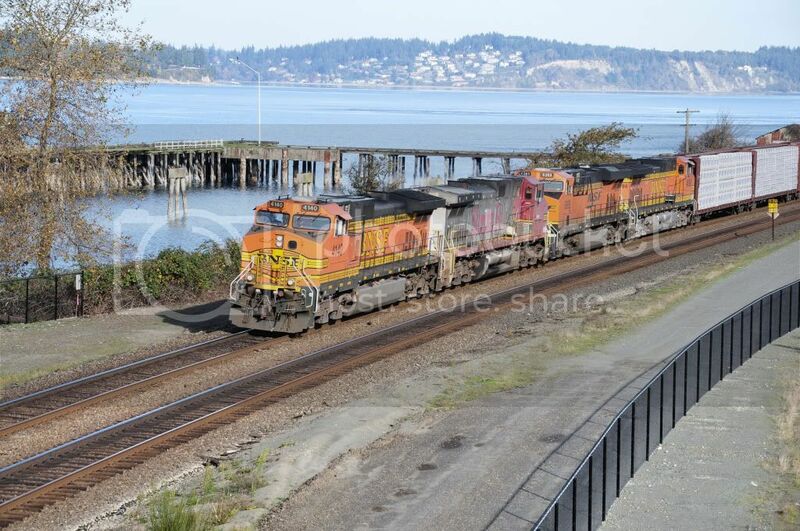 Was this you passing by Edmonds? The tug was towing a barge, which I did not include in the photo. According to an article on the internet, winds gusted to 41 mph at the Edmonds ferry terminal. That is the Pacific Star, the boat I’m on is the one in the picture at the top of this page, Andrew Foss. 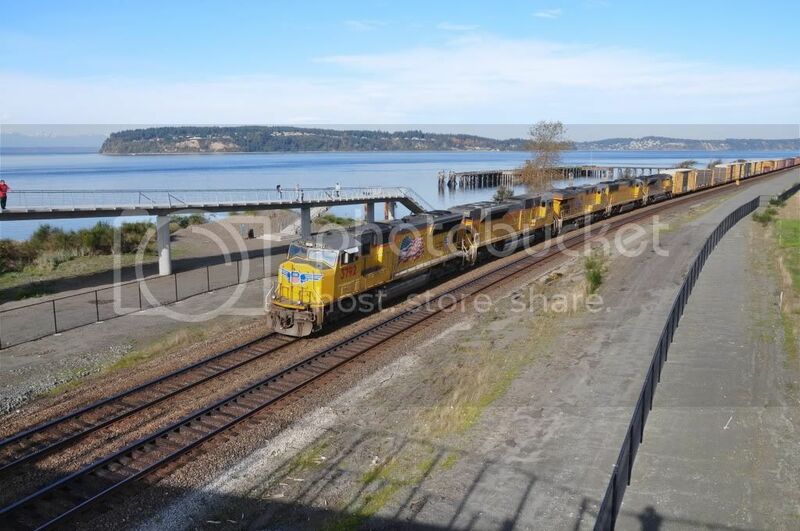 We had both been in Everett for ship work Saturday morning. Winter hasn’t even started? I was afraid of that. I’ll be the first to admit, I’m a fair weather sailor. Bill, Maybe Winter has not “officially” started, but it’s knocking at the door. After we secured the barge in Seattle, (ref: post 17) we waited around for a 2300 ship assist, then off to Anacortes via Deception Pass. A much nicer ride than going out in the Straits. Trying to stay with the water/rail theme is a bit challenging; however, I managed to catch this from our moorings at P-90. Not an ideal place for picture taking.